Snow is snow, right? Not quite. Much like each snowflake is unique, our snow collectively takes on many different forms. It can change from day to day, morning to afternoon, top of the hill to base area. Learn the snow lingo, what you can expect from each kind and how to ski it like a pro with my glossary of snow conditions! Packed Powder: This is the most common member of the snow family, found at ski resorts worldwide. This is snow, that was once powder, that is now packed. Hence the name;). The meat and potatoes of snow, it’s great for all levels of ability. The resort will “groom” acres of it, combing it into a perfectly level, smooth surface just waiting for you to carve out your beautiful rhythmical turns. Bone-y Snow: Packed powder that just hasn’t seen new snow in a little while. It is carve-able, grippy and solid. Not the fluff that Coloradans love, (just fine for the New Yorker in me) and good stuff all the same. You can spin and skid your skis easily over this surface wherever and whenever you want. Powder (AKA Pow, fluff, pillows): This is the best of the best on our possible menu of snow conditions. Powder is deep, dry, fluffy and soft. It skis differently than packed powder, so if you are an easterner, mid westerner or from pretty much anywhere but here, don’t despair if it takes a few runs to get the hang of it. Once you get the feel, it will be the most fun snow you will ever have the pleasure of floating through. Try keeping your feet in a slightly closer stance making a platform to keep from digging in too deep. Weight your feet more evenly than you would on a firm surface and steer both feet to draw big C’s in the snow making your graceful arcs. 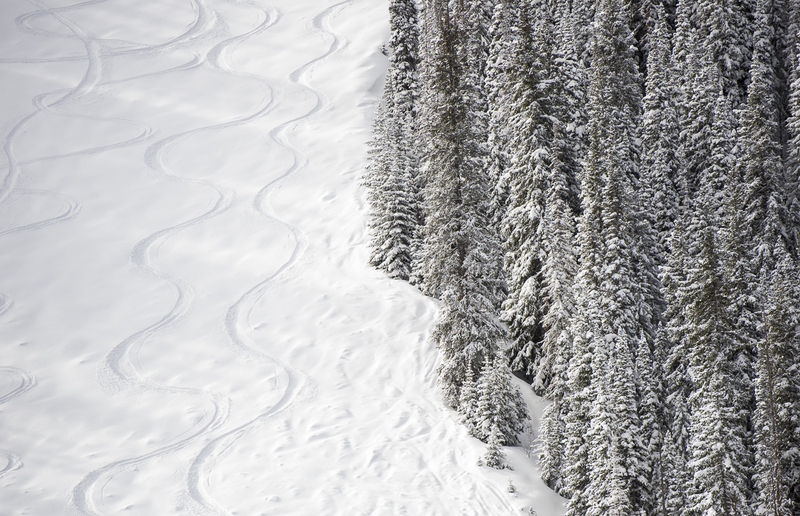 Powder is the finding-a-$20-bill-in-your-pocket kind of snow. Bottomless Powder: Mae West said “Too much of a good thing is…wonderful.” With Bottomless powder, this can be true as long as you keep your wheels on the pavement. If you take a real header you may find yourself (buried) in over your head. This is tricky business to get out of, ski in pairs with ski buddies you can count on. Corn Snow: Not yellow, not kernels. But corn kernel sized chunks that are a cross between ice cubes and slush, usually found in spring time during brilliant sunny days. Corn snow can be great ego-booster snow (easy to carve and shmear, on which most anyone can make turns worthy of an Olympian). You can be tempted in those early warm spring days to break out the shorts and short sleeves to soak up some sun on the warm day. Sounds fun, right? But catching an edge and scraping your bare ski on corn snow, not so much fun. That’s going to leave a mark as they say, and feel like a rug burn. Sugar Snow: Looks a lot like sugar, but acts like corn snow in smaller grains. This can also be awesome ego-booster snow but doesn’t pack or smear and can pile up in those corners where everyone turns in the same spot. These can feel like heavy sand piles that just won’t move when you try to skid a turn. It’s better to ride up on top of these or bank your turns off them like racing in the ruts of a slalom course. Frozen Chicken Heads: Ice chunks, yes, the size of a chicken’s head. They can be like big ball bearings but it’s ok, you can ski over and around them. Plan ahead and stay loose so your skiing doesn’t look like you are the proverbial chicken skiing around with…you guessed it, your chicken head cut off. Boiler Plate (From the Ice family and found primarily in the Great Northeast): Boiler plate is a solid layer of ice with lines embedded in it, usually from old frozen Snow Cat tracks. Until a very hot sun hits it (or unless you have Lindsey Vonn’s ski tuner working on your skis) you can’t set an edge in this stuff. You could pull out your hockey skates and have a better shot, but it is best to glide over it with light feet and flat skis until you get to carve-able snow. If you must attempt to turn on this, stand hard on your downhill ski, and point your downhill fist downhill in defiance. This will help you set and hold your edge. Moon Crater: I may have come up with this one. It is a symptom of spring time, when the snow gets soft with sun, freezes as night, and then gets windblown, leaving bumps and dimples, taking on the look of the surface of the moon. “Houston, we have a problem.” If the sun doesn’t show itself the next day, this stays very firm and lumpy. Very tricky to ski without feeling like you are skiing through an earthquake. Give yourself a break, lift off and head back to the groomers. Chicken-Pecking Snow: At the very end of the season, the sun is hot, hot, hot. The snow in the shade is quick, and snow in the sun is slow and sticky. When you’re sliding on the catwalks across shadows it is hard to keep from lurching with the change in speed, looking a bit like …a chicken pecking corn. No big deal and you have to be able to laugh at yourself once in a while. Keeping loose will help you absorb the change in momentum. The list of snow types and forms can go on and on: Sun baked, Cornices, the White room, Snow whales, Hollow snow, Face shots, Mashed Potatoes, Dust on crust, Grapple. A rose by any other name, is still a rose-and it is all snow and it is all good!